On Saturday, we hosted an event at CfA as part of Mozilla's Webmaker campaign. It originally began as a continuation of the #OAHack that PLoS hosted (see post below) but the dates aligned and we were pleased to bring together the related ideas of the open web, open science and open access into one event. 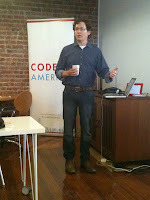 John Wilbanks' started our day with a presentation explaining that if government is a platform, science is a wiki. In its current state, it's a terribly inefficient one, however. He shared some statistics on references to traditional versus open-published papers, such as the number and variety of citations resulting. So why is science such a terribly inefficient wiki and what can we do to improve sharing, reuse, collaboration and ultimately progress?